Students from Tomsk Polytechnic University have reached the final of ACM ICPC, the world’s largest student team programming championship. TPU team placed in the top 17 strongest university teams in the North-Eastern European region. They will compete in programming with the champions from other countries in the final on May 24, 2017 in Rapid City (South Dakota, United States). ACM International Collegiate Programming Contest (the world championship on programming among university teams) is the largest student team programming contest, which has been held since 1977. 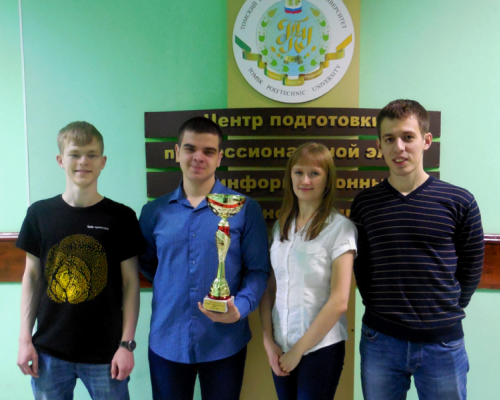 In the world championship final Tomsk Polytechnic University will be represented by the students of the Institute of Cybernetics: Alexei Vetrov, Olesya Golub and Nikolay Kuzivanov. To get to the final from the North-East European Region the students competed with 268 teams from Russia, Belarus, Georgia, Kazakhstan, Kyrgyzstan, Uzbekistan, Estonia, Latvia, Lithuania, Armenia and Azerbaijan. The ACM ICPC championship is run in three phases: a sub-regional (quarterfinals), regional (semi-finals) and a final. Regional winner teams reach the finals and play for the title of world, Europe, North America and other continents’ champions. As noted by the Institute of Cybernetics (IC), TPU teams participate each year in the quarter and semi-finals of the ACM ICPC world programming championship, but this year they have managed to reach the final for the first time. The University team was coached by Paul Khaustov, an assistant of the Department of Information Systems and Technology, which entered in 2016 the top 200 world's best programmers according to the Codeforces project, uniting people from different countries who are interested in competitive coding. “I started working with students when they were still schoolchildrem. It was immediately clear that they had a good potential, but it took full four years to achieve such a result,” said Pavel. In the quarter final TPU presented ten teams, four of which came in the semi-final stage, and one - in the final of the international tournament. A finalist, a fourth-year student of the Department of Information Systems and Technology Olesya Golub said that she has been engaged with sports programming since school. Now, along with her classmates, she also teaches classes for younger students and schoolchildren of the TPU Lyceum. At the Department of Information Systems and Technology, the TPU Institute of Cybernetics, classes in Programming Olympiad have been held for many years. Also, the Department arranges the university round of the Regional Student Programming Olympiad and TPU Junior, a programming competition among the students of the 1-2 courses. Both of these Olympiads are held in a format similar to the World Championship.